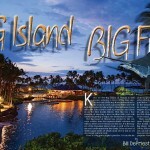 Big Island, Big Fish II. We made a pass through the are and saw good marks on the meter and in a matter of seconds the stinger line is bit and again line is screaming off the reel. We are Hooked Up Again! Dianne is in the chair and this fight is a little different than the first one. The line goes tight and she begins to struggle to bring in the fish. We know this is a nice one. After about a 20 minute battle, her fish is to the boat. 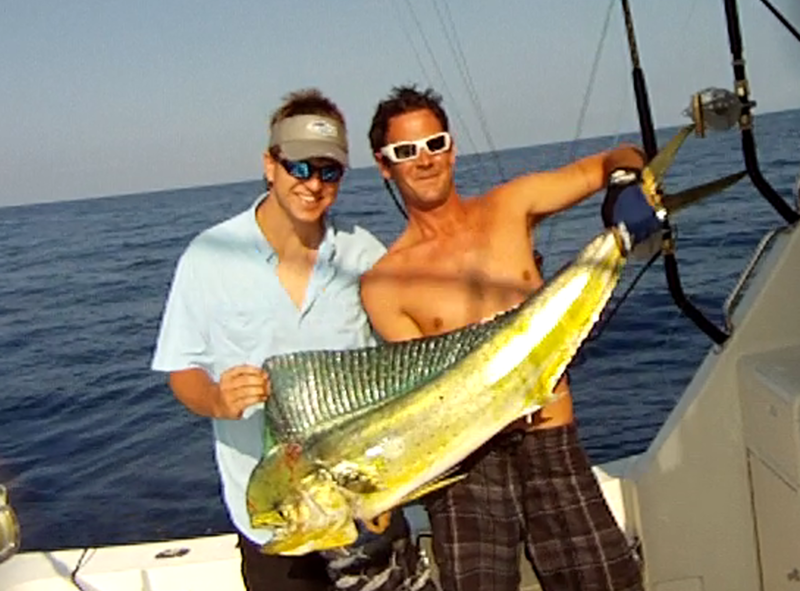 Russ Whitman was the Gaff Man, assisting our deckhand Adam who leadered the fish and held it for Russ to stick. 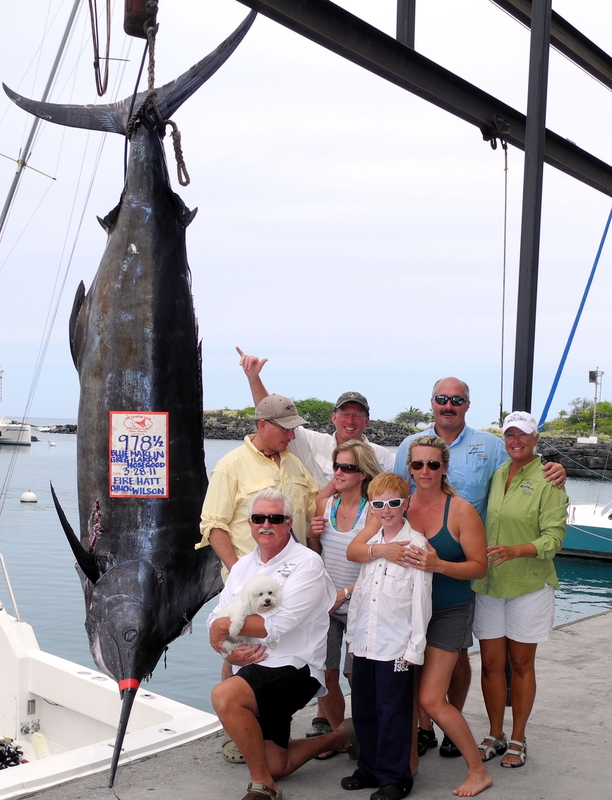 Big Island, Big Fish II. Russ and Debra Whitman from Redondo Beach, CA. 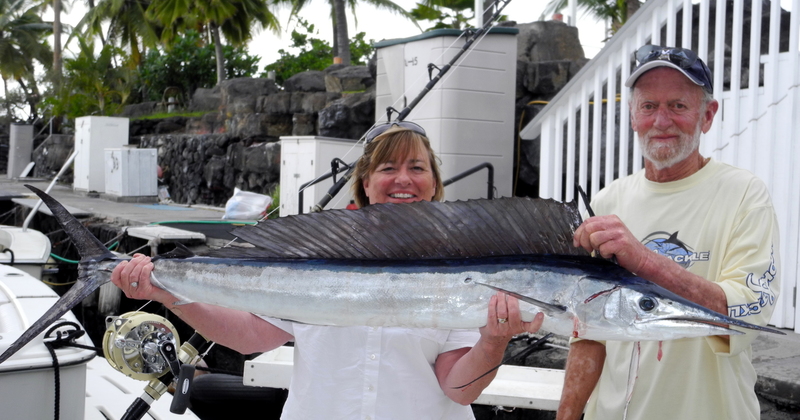 Avid fishermen and boat owners have been fishing in Kona for many years. Over that time they have caught their share of nice fish here. This year they invited their long time friends Howard and Dianne from the Oxnard, CA area to join them. 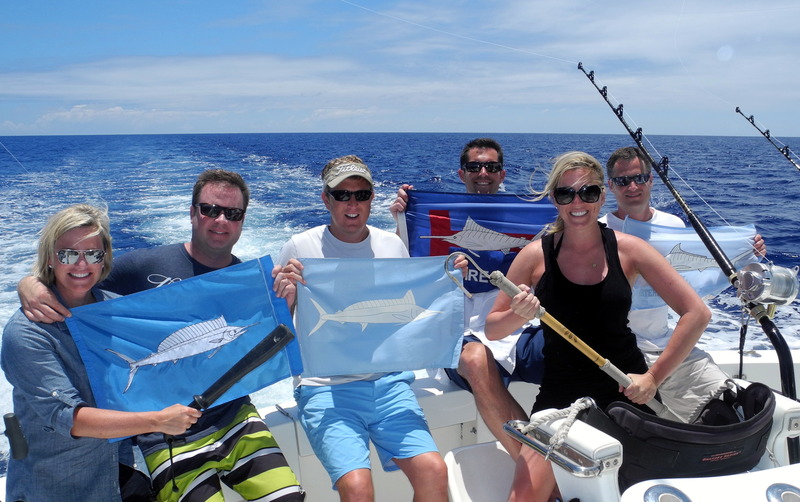 This is their first time to fish in Kona. 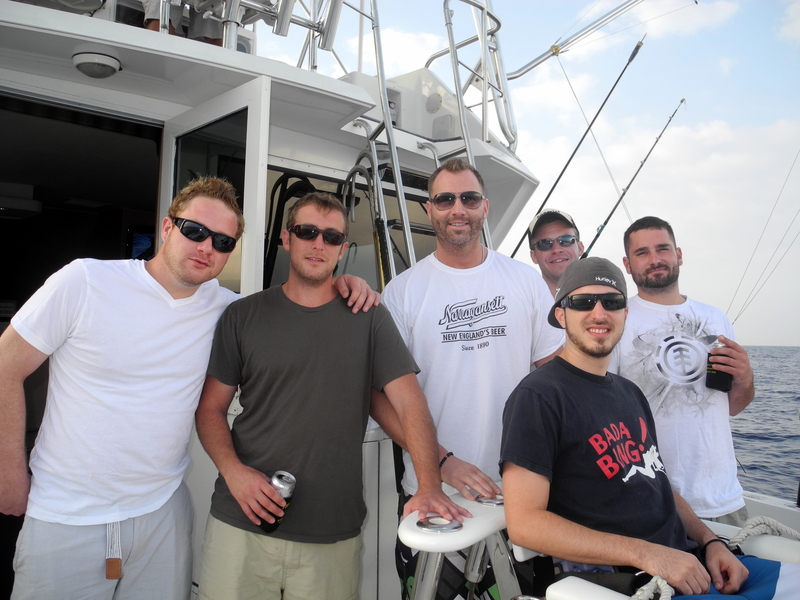 As they all boarded the Fire Hatt this day, they are joking about what they want to catch. 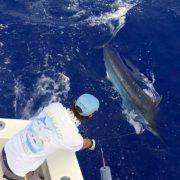 Of course a nice Pacific Blue Marlin is on order. After leaving the harbor and heading straight offshore, we have our first bite. The long rigger line is bit, we are Hooked Up! 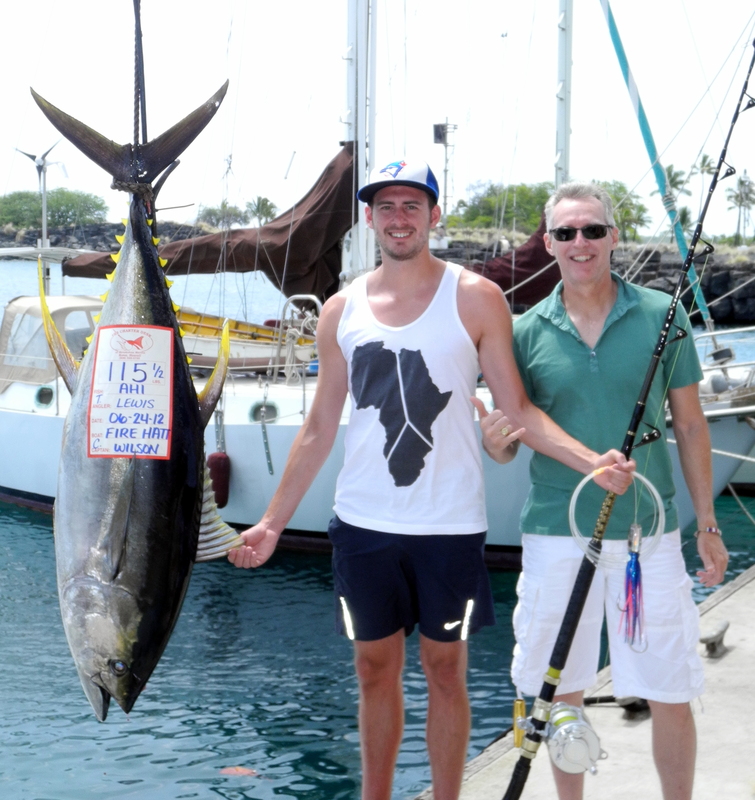 Howard is in the chair first and proudly brings in a nice 8+ pound Ahi. He is so proud and I think this is the largest fish he has ever caught. The mood on the boat is quite festive and the lines are back in thw water now to try for another fish for Dianne. As we approach “F Buoy” we notice a few birds on the outside of the buoy and go to take a look. We made a pass through the are and saw good marks on the meter and in a matter of seconds the stinger line is bit and again line is screaming off the reel. We are Hooked Up Again! Dianne is in the chair and this fight is a little different than the first one. The line goes tight and she begins to struggle to bring in the fish. We know this is a nice one. After about a 20 minute battle, her fish is to the boat. Russ Whitman was the Gaff Man, assisting our deckhand Adam who leadered the fish and held it for Russ to stick. 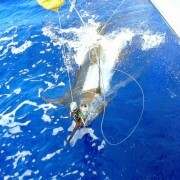 With the fish secured on board high fives were flying. Nice teamwork! 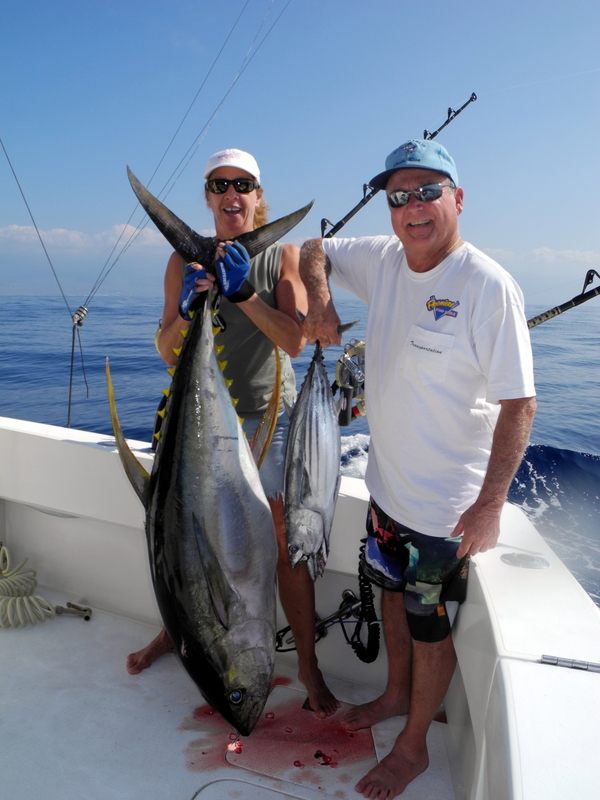 We brought Diannes prize to the weigh dock and found the Yellowfin to weigh 126 pounds. This is the biggest fish she has ever caught or seen. I think this will be a Christmas she will not soon forget.